1. Your mini session will not be successful without a good marketing campaign. 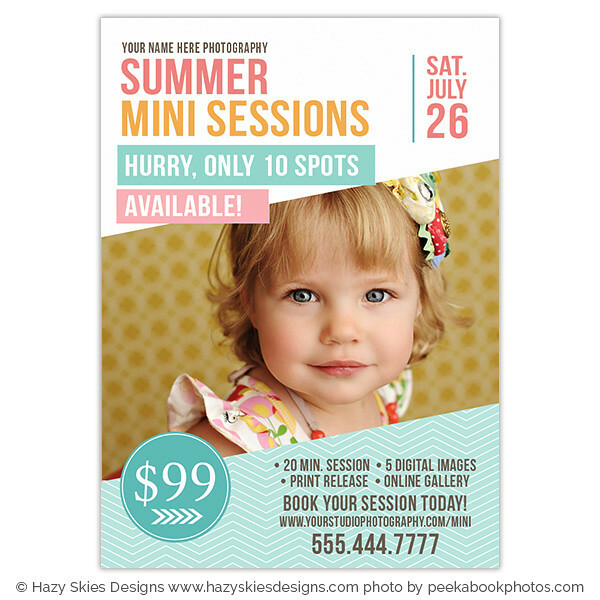 Promote your mini sessions on you blog and social media sites with one of our easy to customize mini session templates. Don't forget to tag clients on your Facebook page, which will allow their friends and family to see your post. 2. Be sure to stress in your marketing material that you have a limited number of spaces available. A sense of urgency will encourage clients to sign up sooner rather than later. 3. It's best to schedule all of you mini sessions one after another on the same day. Allow a maximum of 30 minutes per session. 4. Arrange the mini session around a particular theme (Valentine's Day mini session, Easter, etc). Keeping it to one theme will help keep things simple for you and allow you to shoot more quickly. 5. Ask clients to arrive 10 minutes early so you do not fall behind schedule. 6. Don't shoot too many photos. If you take too many images, the process of editing and making proofs will be longer and more difficult. 7. Have a few treats on hand to improve children's attitudes. You won't have time to coax little ones into behaving for the camera. Content is copyright Hazy Skies Designs and may not be used without permission.